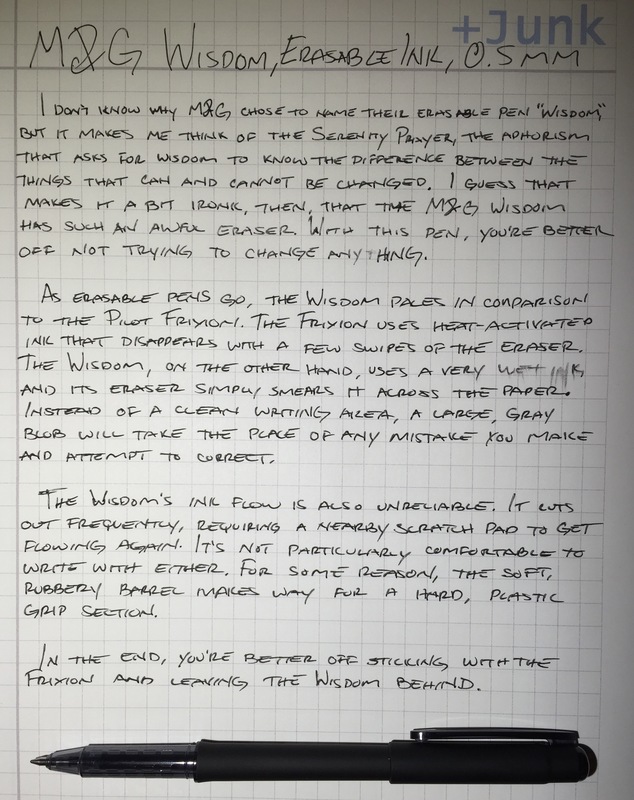 I don’t know why M&G chose to name their erasable pen “Wisdom,” but it makes me think of the Serenity Prayer, the aphorism that asks for wisdom to know the difference between the things that can and cannot be changed. I guess that makes it a bit ironic, then, that the M&G Wisdom has such an awful eraser. With this pen, you’re better off not trying to change anything. 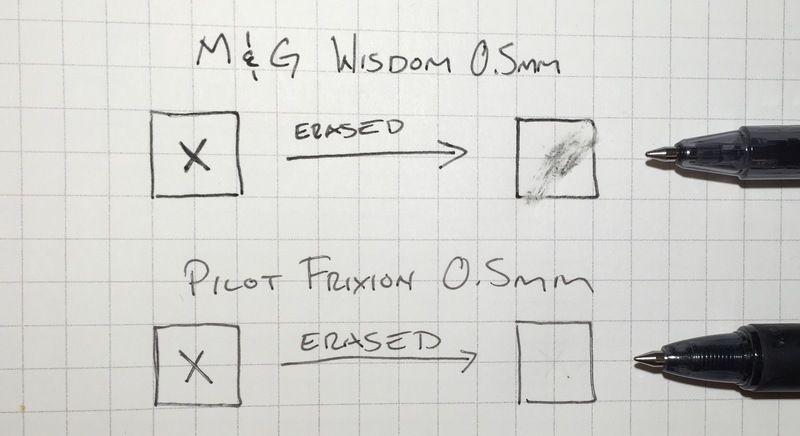 As erasable pens go, the Wisdom pales in comparison to the Pilot Frixion. The Frixion uses a heat-activated ink that disappears with a few swipes of its eraser. The Wisdom, on the other hand, uses a very wet ink, and its eraser simply smears it across the paper. Instead of a clean writing area, a large, gray blob will take the place of any mistake you attempt to correct. The Wisdom’s ink flow is also unreliable. It cuts out frequently, requiring a nearby scratch pad to get flowing again. It’s not particularly comfortable to write with either. For some reason, the soft, rubbery barrel makes way for a hard, plastic grip section. So, in the end, you’re better off sticking with the Frixion and leaving the Wisdom behind. How can you distinguish between a heat-activated ink and a wet ink? I’ve never had a pen with an eraser. I didn’t know they existed.